This is one of the hottest days—or at least one on which the heat is most oppressive—I’ve ever known, but I had a life-giving breath of air just now when your wire arrived.See telegram of July 21, 1934. I’m delighted that you are getting that textile,BZ.1934.1. and I congratulate you with all my heart. 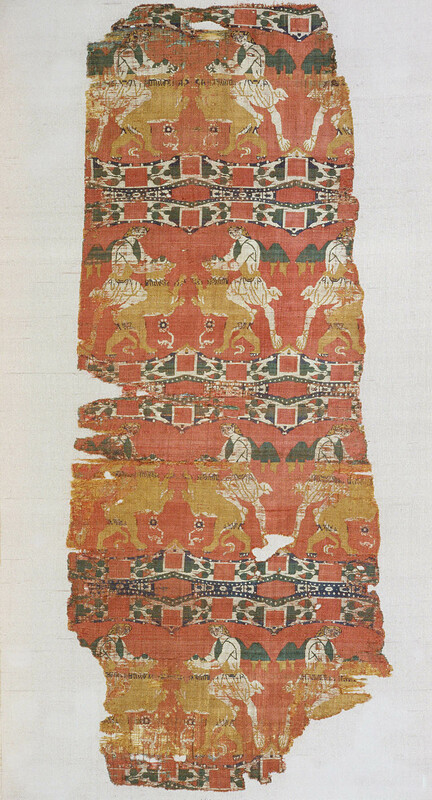 It is certainly by far the most important, the biggest and best preserved of the Earlier Byzantine textiles, and it will be in a worthy place in the company of ECTÍA ΠOΛUÓΛBOCBZ.1929.1. and the nereids,BZ.1932.1. & the patenBZ.1924.5.—to speak only of its contemporaries. I only wish our Vol. IIL’art byzantin. wasn’t all printed and bound and ready—for it would have been good to mention it there as belonging to the Oaks. I think that for you and your purpose, it’s a much better acquisition than the BoschHieronymous Bosch, Christ Mocked (The Crowning with Thorns), ca. 1490–1500, oil on panel, The National Gallery, London, NG4744, acquired from the Galleria Sangiorgi, Rome, in 1934. (and I’m told the Nt Gal paid 500 000 LireApproximately $26,315 in 1934 or $442,000 in 2011. for the Bosch). Next week (!) on July 31, Bill’s wedding! I hope to go to Antigny for a bit after that, but must be back here 21 Aug. & at Geneva 3 or 4 Sept.